As Donald Trump and Hillary Clinton criss-crossed the United States on Sunday in a final, frenzied burst of campaigning, the Republican said he was the “last chance” to fix a broken country while his Democratic rival said a “moment of reckoning” had arrived. The two candidates in Tuesday’s presidential election presented starkly different views of the nation and evoked similarly disparate reactions from crowds gathered to hear them speak, reports Reuters. In Iowa, Trump said he was the “last chance” to fix immigration and trade. Outside Minneapolis, he said the Somali refugee population there was a “disaster.” Supporters near Pittsburgh booed a song by musician Bruce Springsteen, who is set to campaign with Clinton on Monday night. Chants of “lock her up” came in waves even as news broke that the FBI again said Clinton should not face prosecution for her email practices while secretary of state. As rocker and guitarist Ted Nugent warmed up a Trump rally in a Detroit suburb, he grabbed his crotch. “I’ve got your blue state right here,” Nugent said, referring to states that typically vote for Democratic candidates, including Michigan. “By the way, my language is much, much cleaner, as you know, than Jay Z,” Trump said at the same event. Trump has criticized crude language in a Friday night concert that rapper Jay Z and his wife, Beyonce, held for Clinton in Cleveland. Clinton began and ended Sunday with renditions of “America the Beautiful.” The first was at a black church in Philadelphia, the second time performed by folk singer James Taylor at a get-out-the-vote rally in New Hampshire, where the crowd swayed and sang along, linking arms. Clinton walked onto the stage with Khizr Khan, whose son was a slain Muslim U.S. soldier. Khan addressed the Democratic National Convention in July, criticizing Trump’s proposal to ban Muslims from entering the country and offering to loan him a U.S. Constitution. Some in Manchester held up miniature Constitutions in tribute. 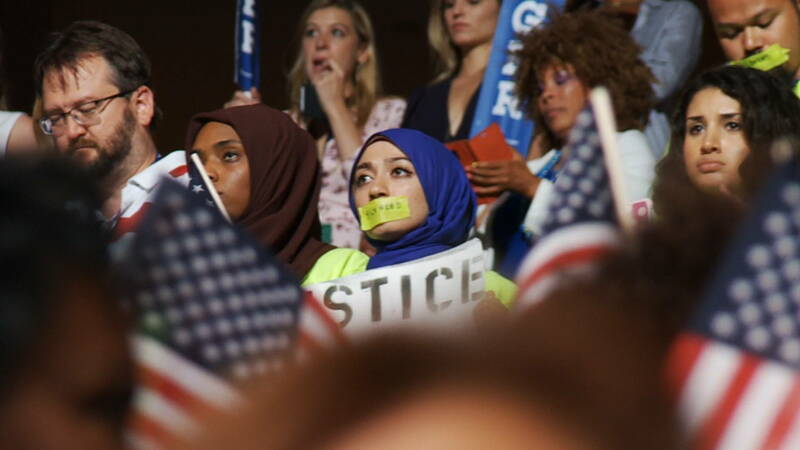 “In a race that has been marked by ugly suspicion and insults and attacks of all kinds against immigrants, Muslims and so many others, Mr. Khan, I think, reminded all of us that we are Americans,” Clinton said.